It’s one of the easiest and most popular dishes to make at home. Just boil noodles, heat a jar of sauce, and voila! What many don’t realize, however, is that with some attention to detail and just a few extra steps, you can take your spaghetti with marinara sauce from serviceable to restaurant-quality. Here are a few tips from the pros. This may not sound like a “hack,” but it’s way easier to do than most people think. All you need are four ingredients, according to celebrity chef Fabio Viviani: garlic, olive oil, basil and a large can of whole plum tomatoes (he and others recommend the San Marzano variety of tomatoes, which derive from the volcanic soil around Naples). Heat six smashed garlic cloves with some olive oil, add in the tomatoes and cook for 10 to 15 minutes, adding the basil at the very end. 2. USE A POTATO MASHER. To break down those sauce tomatoes, you could smash them by hand, or use the same wooden spoon you use to stir. (You could also puree them, but most chefs say that’s a no-no.) Or, you could do like Scott Conant of Scarpetta does and use a potato masher, which allows for an even consistency while still keeping the sauce thick and flavorful. 3. GET THE WATER RIGHT. Using too little water can cause noodles to clump while they’re cooking, according to Giuliano Hazan, son of legendary Italian chef Marcella Hazan. He recommends using six quarts of water for each pound of pasta. When in doubt, use more than you think you’ll need—but not so much that the pot overflows while boiling. 4. DON’T ADD OLIVE OIL. Many believe that adding olive oil to the pasta water will keep the noodles from sticking together. Not true, says renowned chef and cookbook author Lidia Bastianich, who points out that well-cooked pasta should be naturally stick-free. 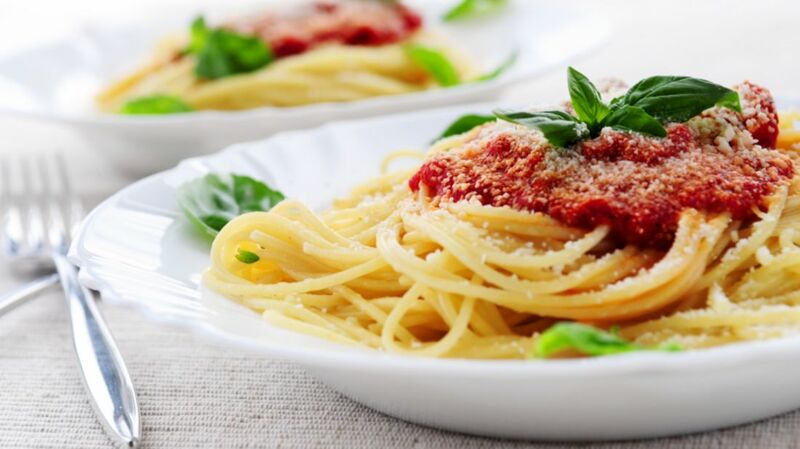 Adding olive oil can also keep the sauce from adhering to the pasta, according to Alton Brown, keeping ingredients separate that should meld together. 5. SALT LIBERALLY, AND AT THE RIGHT TIME. Just a pinch won’t do it, according to Del Posto chef Mark Ladner. To truly bring out the flavor of the pasta, add one tablespoon of salt per quart of water. As Mario Batali points out, the water should taste “like the sea” (note: do not taste boiling water). As far as timing goes, wait until the water is boiling, but before you’ve put in the pasta. This allows the salt to infuse the water without affecting the boiling time. 6. TURN OFF THE HEAT AND COVER THE POT. 7. COOK THE SAUCE IN A SKILLET. Forget using a small pot, or even a saucepan, to heat your sauce. As Bastianich tells it, a skillet is the way to go, mainly because it cooks evenly, allowing the sauce to thicken quickly. With its flared sides and lighter weight, a skillet also lets you toss the pasta and the sauce together. 8. ADD A PINCH OF SUGAR. A touch of sweetness can help balance out the flavor of your sauce. Brooklyn chef Jen DePalma says she always adds a pinch of sugar to her sauce, which tones down the acidity and keeps it from tasting too bitter. 9. COOK THE PASTA WITH THE SAUCE. This might be the most crucial hack of all. As numerous chefs point out, pasta and sauce should be cooked together so that the sauce coats the noodles. Celebrity chef Michael Chiarello recommends taking the pasta out of the water four minutes before the cook time listed on the package, transferring it to the sauce skillet and cooking the two until the pasta is al dente. Batali adds that you should only bring your sauce to a boil after adding the pasta, then simmer the two until finished. 10. USE THE PASTA WATER. Don’t pour out that water after you’ve transferred the pasta. As Jason Pfeiffer, chef-de-cuisine at Maialino tells Epicurious, a splash of starchy pasta water on the noodles and sauce will help bind the two together. 11. DON’T FORGET THE FINISHING TOUCH. Chef Ken Arnone recommends adding fresh sliced basil to your sauce five minutes before it’s done cooking. If you’re going more indulgent, do as Scott Conant does and add a tablespoon of butter. After plating, you could go the traditional route with Parmesan cheese. Or, you could follow chef Elena Karp’s recommendation and add shaved pecorino cheese along with a hint of parsley.